Time for a true price comparison. Baseboarders vs the competition. Aesthetically few would argue that Baseboarders have any competitors at all. But for those carefully monitoring their renovation dollars, here’s how the numbers shake out. If you need a primer on dummy covers, see our post from May 2013. Dummy covers are cheap to buy and very expensive to install. – Time needed to replace the old covers – Minimum 20 minutes per foot. This involves removal, patching the wall and then installing the new ones. Dummy cover solution total cost: $25.67 per linear foot installed. – Time needed to install Baseboarders – About 30 seconds per foot. This involves removing the existing endcaps and front plate then dropping the Baseboarders into place. Baseboarders easy slip-on solution total cost: $23 per linear foot installed. 1.) Dummy cover installation requires tools and a level of skill that the vast majority of end-users will not possess. As a result they will opt to contract skilled or semi-skilled labor. 2.) Dummy covers require that every part of the original cover is removed. This can sometimes mean the hydronic system has to be drained. Such a maneuver would significantly add to the labor cost, but I have chosen to assume this procedure is not necessary for most renovation projects. One of the most misunderstood aspects of the dummy cover renovation solution is the difficulties associated with changing out numerous bits of sheet metal that were never intended to be replaced. Nailing the back plate to the wall was a great way to ensure they’d only be coming off if a saw blade could get between the back of the heater and the Sheetrock. I have spoken with hundreds of plumbers and hands-on heating technicians over the years. I have yet to meet one that has told me the job is easy and it’s the type of work they like to get. 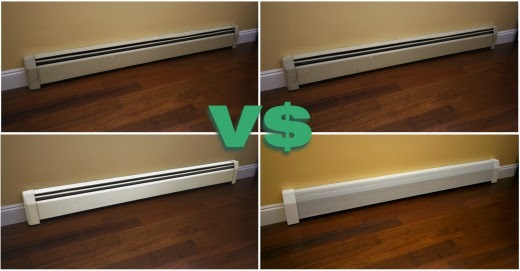 If you’ve ever replaced your baseboard heater covers with dummies, please leave a comment.